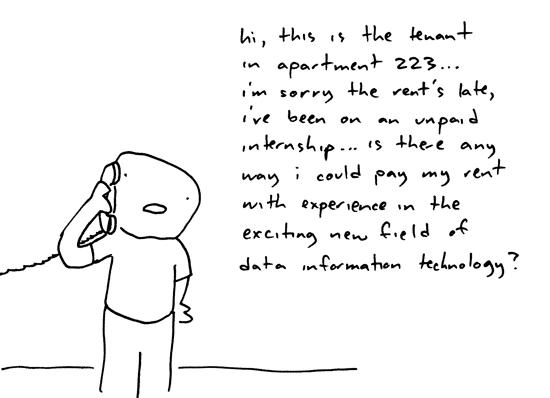 College and grad students love unpaid internships. However, it’s very possible that your “unpaid internship” is in direct violation of federal and state (maybe, depending on what state you’re in) labor laws, especially if the internship is with a for-profit business, and your work is supplanting a paid employee. Shockingly, the Fair Labor Standards Act imposes draconian requirements on businesses like the “minimum wage” and “overtime pay.” What is this, Soviet Russia? Well, a few lawsuits, along with a new administration more eager to enforce federal labor laws than its predecessor, have brought home to many law firms (and other businesses) the painful fact that you generally have to pay people when they’re doing work for you. And since you can’t pay buy groceries or pay your taxes on “valuable experience,” that compensation generally has to come in the form of money. Many argue that full-time unpaid internships should be illegal. After all, many college and grad students cannot afford to spend their entire summer working a job for which they don’t get paid. They have bills to pay, after all. Nonetheless, in most competitive fields, including law, every bit of experience counts. And if the resume of one student or recent graduate isn’t as well-rounded as that of another, a prospective employer isn’t really going to care that the student had to take a job at Starbucks to get by over the summer, and didn’t have time to do some kind of internship. Those students who are more well off, and can afford to go through a summer with no income other than from their family, or trust fund, or whatever, will necessarily be able to take valuable, but unpaid, internships, which will put them in a better position upon graduation than their classmates who are less wealthy, and had to work menial jobs over their summers just to survive. If you’re interested, this blog post gives some factors to consider in determining if your “intern” is actually just an unpaid employee. If they are, you probably want to start paying them, even if it’s just minimum wage. 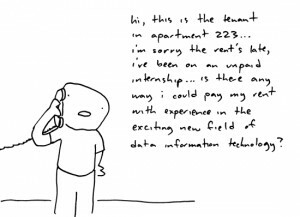 However, many people, including the blogger above (who argues that full-time unpaid internships should be illegal) argue that, if certain guidelines are followed by the employer (the internship is highly educational to the intern, provides valuable experience, and does not amount to free menial labor for the employer), unpaid part time internships should be allowed. After all, as the current situation illustrates, many students are willing and eager to work for free if they believe it will help their career in the long run. If employers are forced to pay every intern for the opportunity to gain experience, even if the employer doesn’t get much economic benefit from the work the intern is doing, businesses will offer far fewer internships. On the other hand, if they didn’t have to pay for full-time work, as I mentioned earlier, only students from relatively wealthy families would be able to afford to take these internships, and that would put lower-income students at even more of a disadvantage. However, if they were required to pay for full-time interns, far more lower-income students will be able to afford to take these jobs, and the playing field will be significantly more level, and this should benefit employers as well. After all, they’ll have a much wider selection of potential interns, potentially allowing more qualified interns to take these jobs when they previously couldn’t. Of course the laws of supply and demand tell us that such a law will make internships scarcer. This certainly doesn’t help anyone. I think that a good compromise would be to allow (with tight oversight to ensure that the privilege is abused) full-time interns to be paid slightly less than minimum wage, if it can be shown that this would allow a company to hire full-time interns (if it would otherwise be unable to) or hire more interns than it otherwise could. However, companies offering part-time internships, which are often the bread and butter of students seeking practical job experience, should continue to be allowed to offer them without pay. This would allow them to offer essentially as many internships as they are capable of accommodating, without a serious financial impact. It would also allow lower-income students to work a second part-time job to pay the bills. Another controversial wrinkle comes in when universities get involved in the unpaid internship, and coordinate with employers, offering academic credit in exchange for the work done. Usually, it is against university policies to offer money in addition to academic credit for internships. While academic credit is certainly valuable (after all, you need a certain number of credits to graduate), it doesn’t pay the bills. A blog focusing on such issues at Northwestern University (though it’s applicable at universities everywhere) argues that students who take unpaid summer internships for class credit are actually being taken twice. First, they are working without being paid. Second, they actually have to pay their school tuition for the privilege of working for a company, not directly affiliated with the school, without pay. Sweet deal, no? Honestly, though, I’m not sure I buy everything that the above blogger says. Unpaid internships, while they certainly can be abused by schools and/or employers, aren’t necessarily a cash cow for universities. After all, universities which allow students to complete internships for credit have to coordinate closely with employers. Furthermore, they have to monitor the work that employers assign to students, to ensure that it is substantive and relevant. They also need to handle complaints against the employer by students, in the event of sexual harassment, or, more commonly, abuse of the unpaid internship privilege on the part of the employer. In the end, it seems to me that unpaid internships are an essential part of today’s educational and economic system. There are plenty of things about any job that simply can’t be learned in a classroom. However, the fact is that many interns are assigned trivial make-work in order to get some necessary experience, which, while educational, is not necessarily economically valuable to employers. To force employers to pay interns for work that doesn’t directly benefit them would make this experience much harder to obtain. At the same time, certain employers must be required to pay for certain internships, especially those which amount to full-time jobs. This will give many, many more students (not just the ones who can afford to go through a summer with no income) the opportunity to participate in these programs. Great post, I tend to think that while unpaid internships are exploitative in nature, they are a necessary evil. I currently have an unpaid internship, and while I wish it were a paid internship, I can’t deny the valuable experience I am getting from it. Many companies cannot afford to pay interns (like the one I work for), so taking away unpaid internships would damage many of these small businesses. Perhaps we should require companies that can afford to pay interns to do so, and leave those smaller companies alone.